How adorable is this minion? 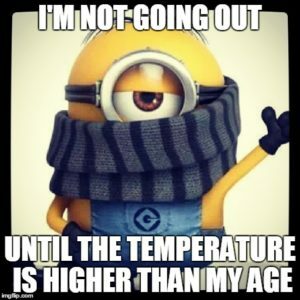 And just imagine the temperature always being higher than your age. Sigh, what a dream world that would be. I’d honestly pay like a whole dollar to make that world be a reality. Or maybe even a toonie #BrokeStudentLife. Until we somehow make that happen, it. Is. Freezing. Why can’t we just skip winter and go straight to the ever beautiful spring? Ugh #FirstWorldProblems. Anyhoo, there was so much fire spit in the studio, that I was scared I’d have to call 911. With songs like Low, Right Round, and My First Kiss, things started to get reaaaaaaally hot. But then when our very own DJ SMALLZ requested Fire Burning by Sean Kingston, that fire officially started burning (bad pun?). For the weird Wednesday article, I talked a little about Mr. Kanye West (#KANYE2020) and how he’s got a plan to launch his own streaming service- with music, videos, pictures, etc. this may be the next YouTube. Or you know, YeTube. He was part of Jay-Z’s Tidal service until this summer where for unknown ($) reasons he quit. And now he’s getting into this business himself. Imagine this service where you’re only allowed to share Kanye’s music, his pictures, and his videos. Just Kanye everywhere. Fun stuff? Next up, another misheard lyric was played, I don’t know what it is about people hearing the word “fart” in every song but cmon, it’s ruining so many songs for me! So Ariana Grande, in One Last Time, gracefully says “I know I should’ve fought it, at least I’m being honest” but you people think that she totally sounds like “I know I should’ve farted, at least I’m being honest”. I cannot get through saying this misheard lyric without just dying in the studio, talking about farts makes me laugh. I’m a child I know kthxbye. Before getting into current music, I did do a quick PSA: older OneCards are soon going to be ineffective, so please go into the OneCard office and grab yourself a new one, they’re already printed out for everyone so you literally just have to go in, sign and leave. It took me like 38 seconds. They’re nice and shiny and apparently they’re SmartCards for getting into rooms in Laz, etc. Haven’t tried that part yet but please go ahead and get yourselves your new cards. In terms of Laurier events, all your favourite Radio Laurier DJs will be on campus promoting their shows, so if you want to meet them, this is your chance. I’ll personally be in the Concourse next Wednesday promoting my show, so this is your chance to see the beautiful face of the beautiful voice y’all have been hearing for the last year and a bit. Then finally, it was time for current music, I tried slowly moving into it from 2013-2017, with hits like Pompeii, Sorry, Black Beatles, Rockabye, and Havana. I did also talk about the strike that’s happening right now across the province throughout the colleges, and how over 500,000 students are sitting home not knowing what’s next. I didn’t want to bias anyone with my own opinions so I did ask y’all to do some research and let me know how you feel, let me know in the comments section or send us a message or tweet at @RLMorningShow and address it to me. Any way you can do it, I really want to know how the general student population of WLU feels about this whole situation. That said, it was a great show, starting ritualistically with some technical difficulties but then some serious fire was spit from that point onwards. As mentioned, do check out the concourse as throughout this entire month, your favourite DJs will be boothing and promoting their shows, great chance for you to connect with them! As always, thank you all for tuning in and making the show possible. Do remember to follow us on our social media handles, as any and all song requests are accepted on our Twitter handle @RLMorningShow. See you guys next Wednesday @10am! DJ Thr0wBack out!